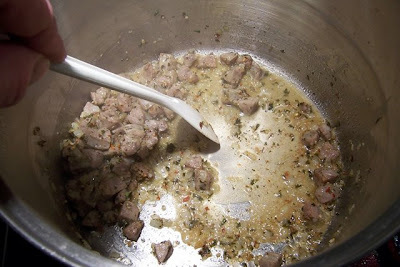 Note: Hey Kids, I've been tweaking the soup a bit, so I made some revisions to this recipe. 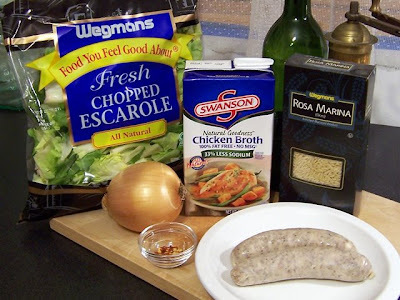 *again, I'm using pre-cooked Italian sausage from a local shop. 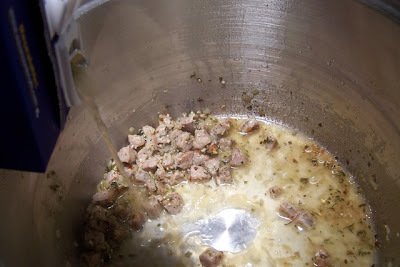 Try this: next time you're cooking sausage, cook a few extra and stash 'em in your freezer. 1. In a stock pot over low heat, sweat the onion, carrot and celery in the olive oil, with a pinch of kosher salt and a few grinds of black pepper. 2. 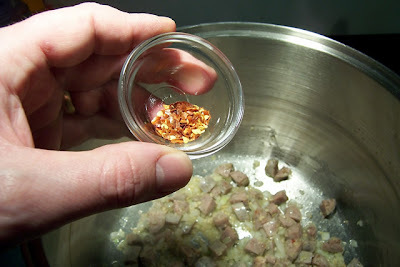 When the onion is almost translucent, add the garlic and sausage to brown. 3. 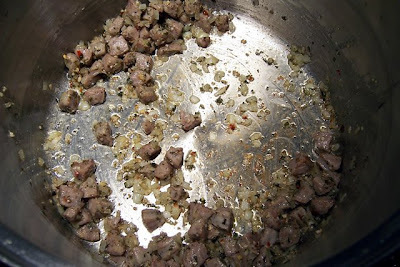 After the sausage has browned a bit, add the red pepper flakes, oregano and parsley, and continue browning. 4. 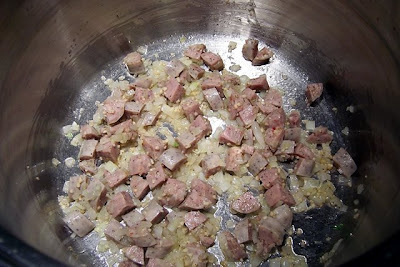 When browning is done, add about 1/2 c. of the chicken stock to deglaze the pot and recover all the tasty bits of onion and sausage that stuck to the bottom. 5. 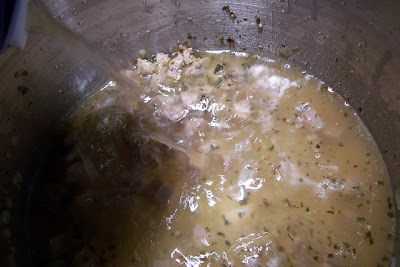 Once the pot is deglazed, add the remaining chicken stock, and increase the heat to medium-high. 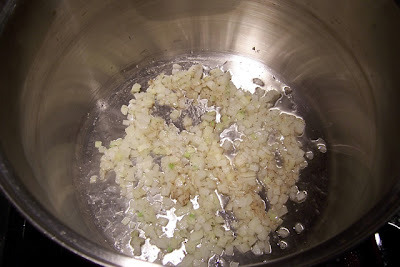 You'll want to bring the broth to boil for a about a minute or two before reducing the heat back to medium. 6. 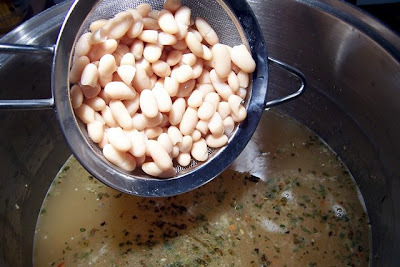 While the stock is heating, add the rinsed, drained cannellini beans to allow then to heat through. 7. Now's the time to also add the orzo. 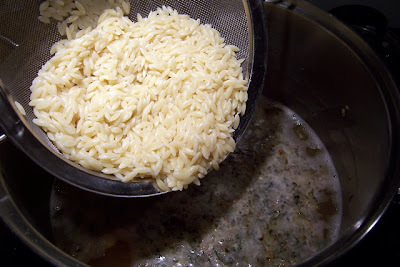 The orzo will continue to cook in the soup, so it's not a bad idea to undercook it just a bit. 8. 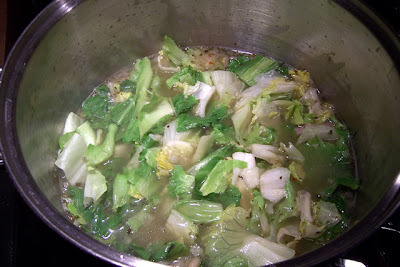 Once the soup has come to a boil, reduce the heat to low, add all of the escarole to the pot and slap on the lid for 5-10 minutes. Psst... come here... closer... 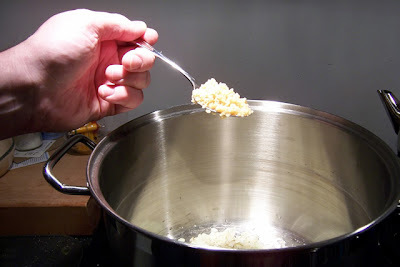 I want to share a little 'soup secret'... just before you declare your soup 'done', add two tablespoons of unsalted butter to the pot and allow it to melt in. The butter adds a nice finish to the taste, and a nice shimmer to the broth. Trust me, this will make your diners go "oooooo". Ladle up the soup into bowls, and garnish with whatever you choose. Personally, I like some parsley and some cubes of romano cheese (does fresh baked bread count as a garnish?) Need to 'brighten' the flavor up a bit? Just add a quick squeeze of lemon juice. Honesty time. 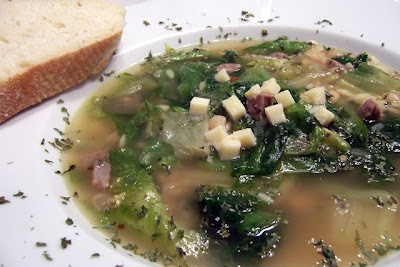 I've never made a soup using any greens. I keep reading about escarole, kale or some other weird green stuff I've never tried before, but it's never made it's way on to the menu. 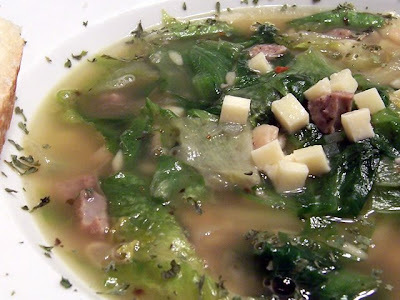 For some reason this soup looks good and simple yet flavorful enough to try. We are soon due for them weird greens at the market, and I may just try it. I'm brave like that.